You can enable SSL in a Drill cluster. SSL (Secure Sockets Layer), more recently called TLS, is a security mechanism that encrypts data passed between the Drill client and Drillbit (server). SSL also provides one-way authentication through which the Drill client verifies the identity of the Drillbit. 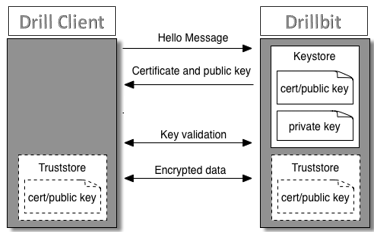 Authentication occurs during the SSL handshake when the Drillbit (server) presents its certificate to the client, and the client checks if the certificate exists in its truststore or if the certificate is signed by a trusted CA (Certificate Authority) that exists in its truststore. The SASL feature in Drill provides authentication and an option to encrypt data, however the encryption feature is not available when using Plain authentication. If you need to use Plain authentication (certain BI tools only use Plain authentication), you can enable SSL to encrypt data. You can have both SASL and SSL enabled when using Plain authentication only. For any other scenario, using SSL and SASL encryption together is strongly discouraged. Note: The REST API supports HTTPS. SSL is not supported for communication between Drillbits. The following sections provide information about how to use certificates in a Drill cluster, enabling and configuring SSL, connection parameters, and common SSL issues. The Drill server requires an SSL certificate. The certificate can be self-signed or signed by a CA (Certificate Authority). Before you can enable SSL in a Drill cluster, you must either get a certificate or generate a certificate and then import the certificate into the Java keystore. You can do this using the Java keytool utility. See To Use keytool to Create a Server Certificate for instructions. If you have a custom certificate, you can import it using the method described in this keytool document. After you generate or import a server certificate, add the path (and password) to the keystore in the SSL configuration for Drill. See the SSL configuration options section below for information on how to update the SSL configuration. Restart Drill after you modify the configuration options. Enable SSL in <DRILL_INSTALL_HOME>/conf/drill-override.conf. You can use several configuration options to customize SSL. You must restart the Drillbit process on each Drill node after you modify the configuration options. When SSL is enabled, all Drill clients, such as JDBC and ODBC, must connect to Drill servers using SSL. Enable SSL in the Drill startup configuration file, <DRILL_HOME>/conf/drill-override.conf. To enable SSL for Drill, set the drill.exec.security.user.encryption.ssl.enabled option in drill-override.conf to "true". You can customize SSL on a Drillbit through the SSL configuration options. You can set the options from the command-line (using Java system properties), in the drill-override.conf file, or in the property file to which the Hadoop parameter hadoop.ssl.server.conf points (recommended). Note: Specifying values in drill-override.conf can expose the security parameters to end users. Administrators should set these values in the Hadoop security file and restrict permissions on that file. If a parameter is specified in multiple places, the value in the Hadoop configuration takes precedence over the Drill configuration, which takes precedence over the system property. The Hadoop configuration is specified in the file pointed to by the hadoop.ssl.server.conf parameter in the Hadoop core-site.xml file. Typically, this parameter points to $HADOOP_CONF/ssl-server.xml, which contains the property names to configure SSL. Both the core-site.xml file and the ssl-server.xml files must exist in Drill’s classpath. Drill’s SSL configuration picks up the Hadoop SSL configuration. Note: Since the Drillbit implementation is based on JSSE, several standard parameters that apply to JSSE will also apply to the Drillbit; however, you typically do not need to configure JSSE parameters. drill.exec.ssl.keyStorePath ssl.server.keystore.location javax.net.ssl.keyStore Location of the Java keystore file containing the Drillbit’s own certificate and private key. On Windows, the specified pathname must use forward slashes, /, in place of backslashes. drill.exec.ssl.keyStorePassword ssl.server.keystore.password javax.net.ssl.keyStorePassword Password to access the private key from the keystore file. This password is used twice: To unlock the keystore file (store password), and to decrypt the private key stored in the keystore (key password) unless a key password is specified separately. drill.exec.ssl.keyPassword ssl.server.keystore.keypassword Password to access the private key from the keystore file. May be different from the keystore password. drill.exec.ssl.trustStorePath ssl.server.truststore.location javax.net.ssl.trustStore Location of the Java keystore file containing the collection of CA certificates trusted by the Drill client. On Windows, the specified pathname must use forward slashes, /, in place of backslashes. Note: If the trustStorePath is not provided, Drill ignores the trustStorePassword parameter and gets the default Java truststore instead, which causes issues if the Java truststore has a non-default password. The Java APIs to load the default keystore assume the default password. The only way to use the default keystore with a non-default password is to specify both the path and the password to the keystore. To work around this issue, pass the default Java truststore to the trustStorePath parameter. drill.exec.ssl.trustStorePassword ssl.server.truststore.password javax.net.ssl.trustStorePassword Password to access the private key from the keystore file specified as the truststore. Use the SSL JDBC connection parameters and fully qualified host name to configure the jdbc connection string in SQLLine and connect to Drill. The following table lists the parameters that you can include in the jdbc connection string using SQLLine. Note: Examples are provided after the table. For additional instructions, see the Drill JDBC Driver documentation. enableTLS true/false [Optional] If true, TLS is enabled. If not set or set to false, TLS is not enabled. trustStoreType string [Optional] Default: JKS The trustStore type. Allowed values are : JKS PKCS12 If the useSystemTrustStore option is set to true (on Windows only), the allowed values are: Windows-MY Windows-ROOT Import the certificate into the "Trusted Root Certificate Authorities” and set trustStoreType=Windows-ROOT. Also import the certificate into "Trusted Root Certificate Authorities" or "Personal" and set trustStoreType=Windows-MY. trustStorePassword string [Optional] Password to the truststore. disableCertificateVerification true/false [Optional] If true we will not validate the certificate against the truststore. False by default. TLSHandshakeTimeout Time in milliseconds [Optional] Default: 10 seconds In some cases, the TLS handshake may fail and leave the client hanging. This option sets the time for the client to timeout. TLSProvider JDK/OPENSSL [Optional] Default: JDK Changes the underlying implementation to the chosen value. useSystemTrustStore true/false [Optional, Windows only] Default: false If provided, the client will read certificates from the Windows truststore. In this case, trustStorePath and trustStorePassword, if specified, will be ignored. The user should set the default provider in $JRE_HOME/lib/security/java.security to SunMSCAPI. The trustStoreType should be set to either Windows-MY or Windows-ROOT. The following examples show you how to connect to Drill through SQLLine with the jdbc connection string when SSL is not enabled and when SSL is enabled with and without a truststore. The default JSSE truststore will be tried with default password; the provided password will be ignored. If the default truststore password has been changed, this gives an error. To use the default truststore with a different password, pass the path to the default truststore with the password. Use the SSL ODBC connection parameters to configure a connection to Drill through an ODBC tool. The following table lists the ODBC connection parameters. Note: The Drill ODBC driver does not support password protected PEM/CRT files or multiple CRT certificates in a single PEM/CRT file. For additional instructions, see the Drill ODBC Driver documentation. SSL Clear (0) No This option specifies whether the cliet uses an SSL encrypted connection to communicate with Drill.Enabled(1):The client communicates with Drill using SSL.Disabled(0):SS Lis disabled.SSL is configured independently of authentication.When authentication and SSL are both enabled, the driver performs the specified authentication method over an SSL connection. TrustedCerts The cacerts.pem file in the \lib subfolder within the Driver's installation directory. The exact file path varies depending on the version of the driver that is installed.For example, the path for the Windows driver is different from the path for the Mac OS driver. No The full path of the PEM file containing Trusted CA certificates, for verifying the server. If this option is not set, then the driver defaults to using the trusted CA certificates PEM file installed by the driver. UseSystemTrustStore Clear (0) No This option specifies whether to use a CA certificate from the system truststore, or from a specified PEM file.Enabled (1): The driver verifies the connection using a certificate in the system truststoreDisabled (0): The driver verifies the connection using a specified PEM file.Note: This option is only available on Windows. If using this option, import the certificate into the "Trusted Root Certificate Authorities” certificate store. DisableCertificateVerification 0 No This property specifies that the driver verifies the host certificate against the truststore. Accepted values are:0: The driver verifies the certificate against the truststore.1: The driver does not verify the certificate against the truststore. DisableHostVerification 0 No This property specifies if the driver verifies that the host in the certificate is the host being connected to. Accepted values are:0: The driver verifies the certificate against the host being connected to.1: The driver does not verify the certificate against the host. The following sections provide insight to some common error messages that you may encounter with SSL. ERROR: No Cipher suites in common. This is a general purpose error message that may have many reasons. The most common reason is that in order to use certain cipher suites, JSSE needs to use the private key stored in the Keystore. If this key is not accessible, JSSE filters out all cipher suites that need a private key. This effectively prunes out all available cipher suites so that no cipher suites match between the client and the server. JSSE does not allow a key password that is null or an empty string even though it is possible to create a keystore with such a key password. Also, JSSE does not provide a system property to specify the key password. Drill provides a way to set the key password, but if you are using only system properties to configure JSSE, Drill will use the keystore password. If the keystore password is not the same as the key password, the key will again be inaccessible. You can validate the keystore using keytool. ERROR: SSL is enabled, but cannot be initialized due to the ‘Cannot recover key’ exception. The key is protected with a password and the provided password is not correct. 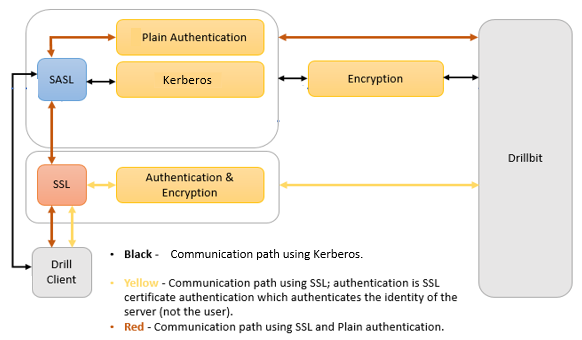 A client connection can timeout because of networking issues or if there is a mismatch between the TLS/SSL configuration on the client and server. Before trying to debug the TLS/SSL configuration, check if the server is reachable from the client. 1-The server is configured to enableTLS and the client is not (and vice versa). java.sql.SQLNonTransientConnectionException: Failure in connecting to Drill: org.apache.drill.exec.rpc.RpcException: HANDSHAKE_COMMUNICATION : Channel closed /10.10.10.11:49907 <-->hostname/10.10.10.11:31010. Hostname verification can be turned off if there is no way to change the host configuration or the certificate. This is generally not recommended.